We have been busy here at the homeplace, battening down the hatches. The lawn and porch has been cleared of anything that might blow away in 60 mile an hour winds, and this morning Rich is going to the store to stock up on essentials, or rather, one big essential for us, which is milk. School has been cancelled for two days, however, as a homeschooling family in prior years, we will be “doing school” regardless. Rich is home with us, as his office has called to advise employees to work from home. All this done in the name of preparation, for hurricane Sandy. 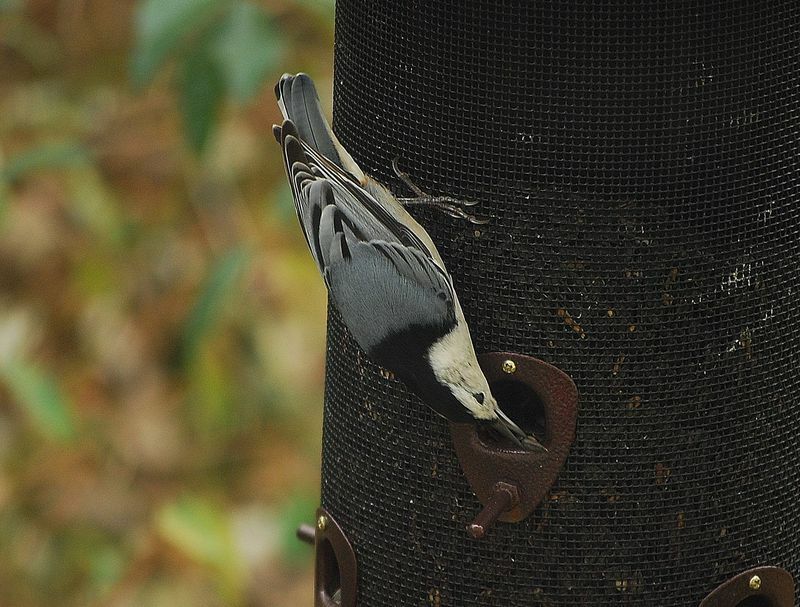 There has been a lot of action at the bird feeders lately. I wonder if the “storm brewing” atmosphere is making the tiny birds extra hungry. 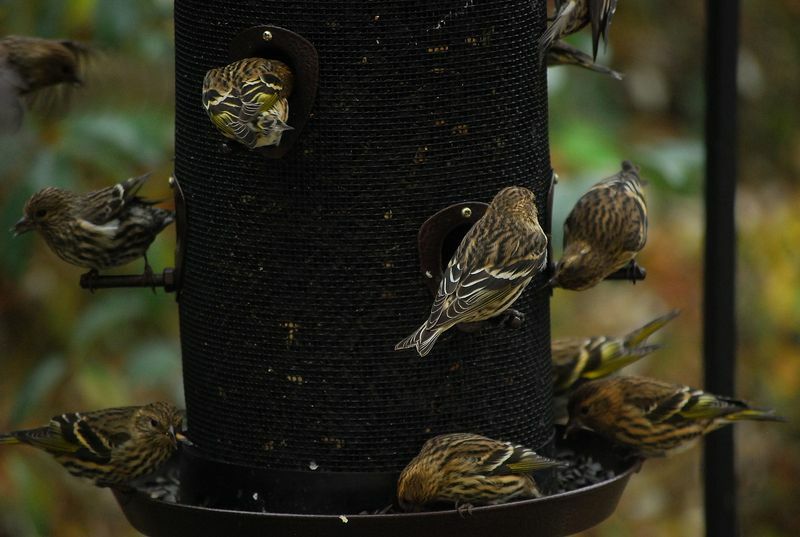 We first noticed an unusual number of Pine Siskins. On a typical day, we may get a couple of them….but for days we had a flock. 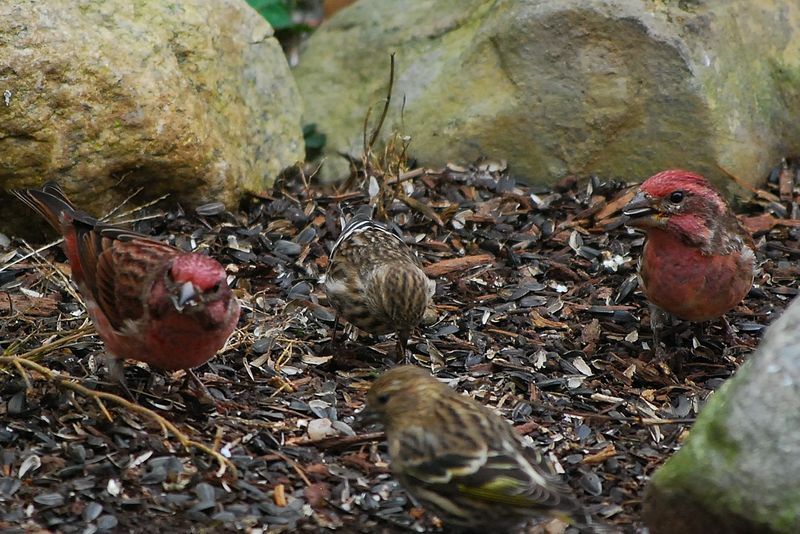 I think these are purple finches. We also have had a lot of mourning doves. We love these gentle, slow walking birds with the blue eye liner. They make me laugh the way they waddle down the bank to the feeders. Grace saw a line of them sitting on the peak of the garage roof. 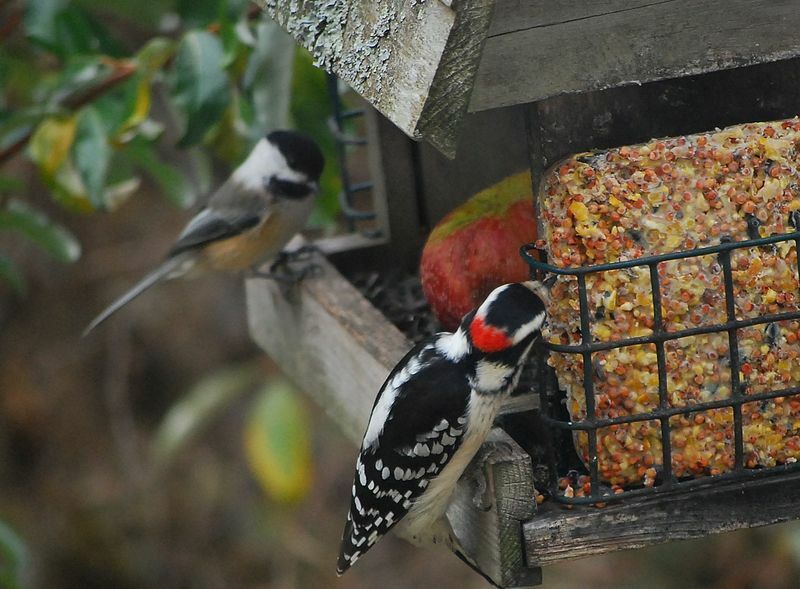 Lots of friendly chickadees come, and this bird with the spot of red is a Hairy Woodpecker. These beautiful birds were excitingly new visitors for us. 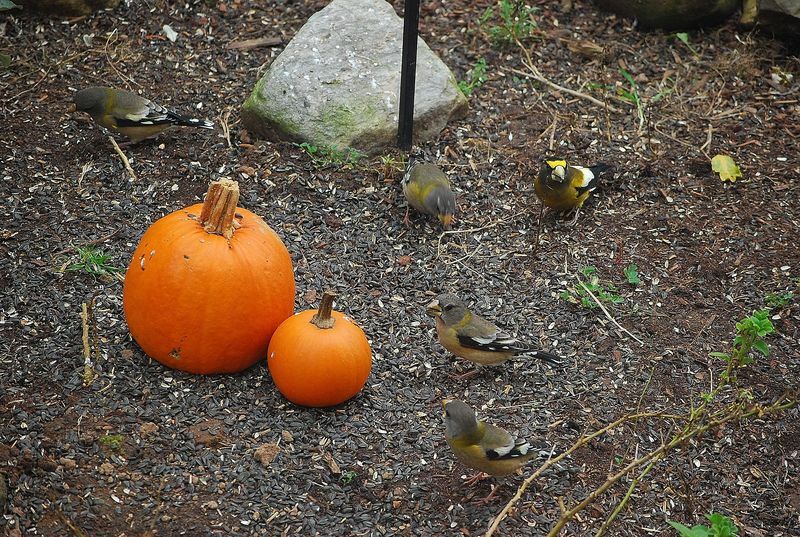 I believe they are Evening Grosbeaks. Nuthatch, I love their upside-down ways. 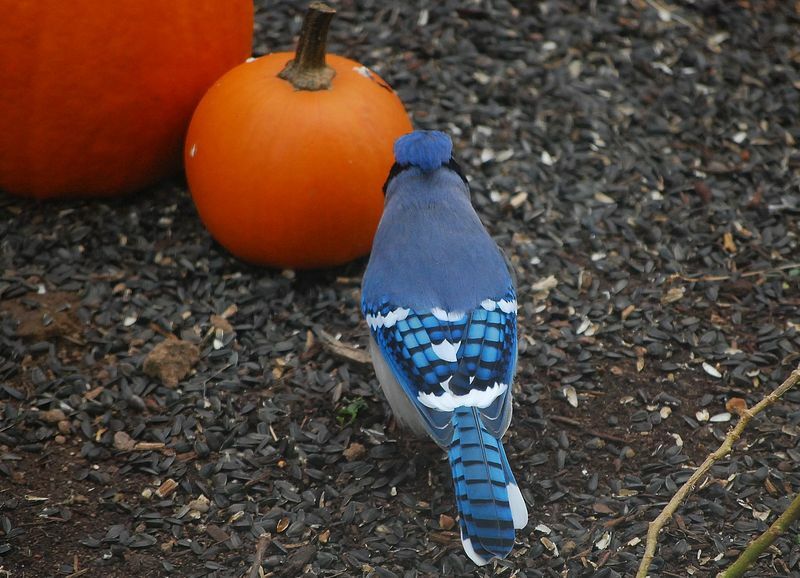 The very lovely blue, but gluttonous Blue Jay. 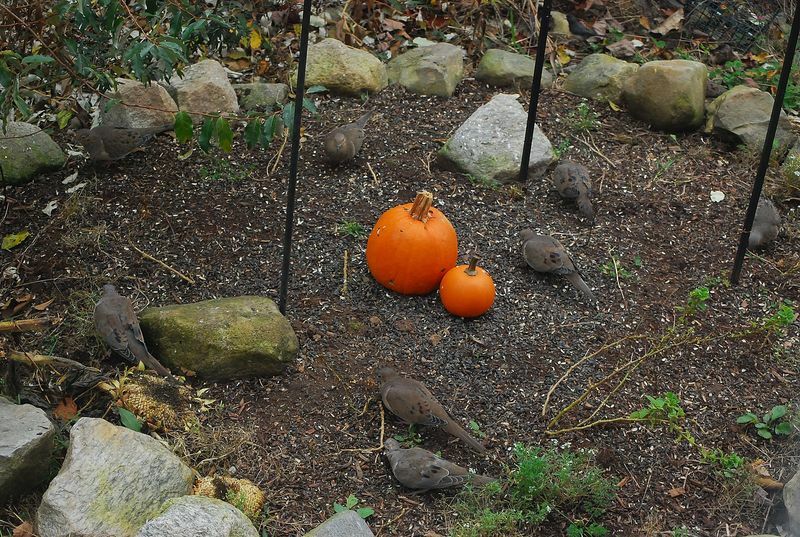 I put a couple small pumpkins on the ground under the feeders, to add more color and interest to my pictures. I wonder if the birds appreciate the fall decor, just for them? We have also seen cardinals, juncoes, titmice, and sparrows. 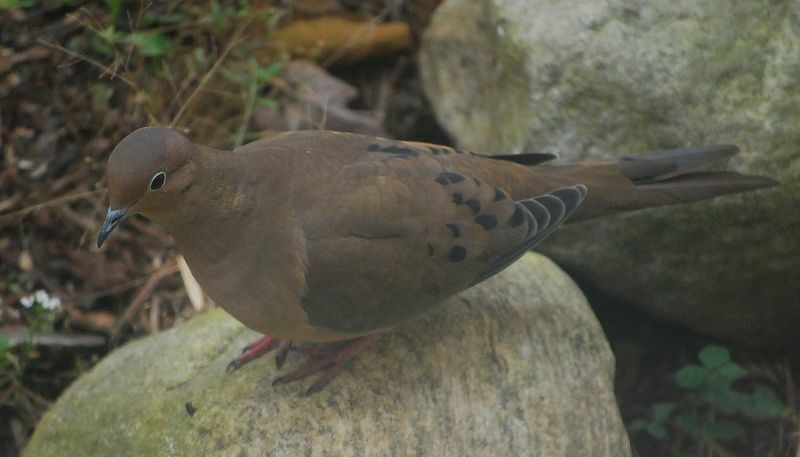 We had about 10 mourning doves visiting at one time. They kept Davy and me busy counting. And then, after the rest of us had walked away from the window, little Sarah saw a SQUIRREL. 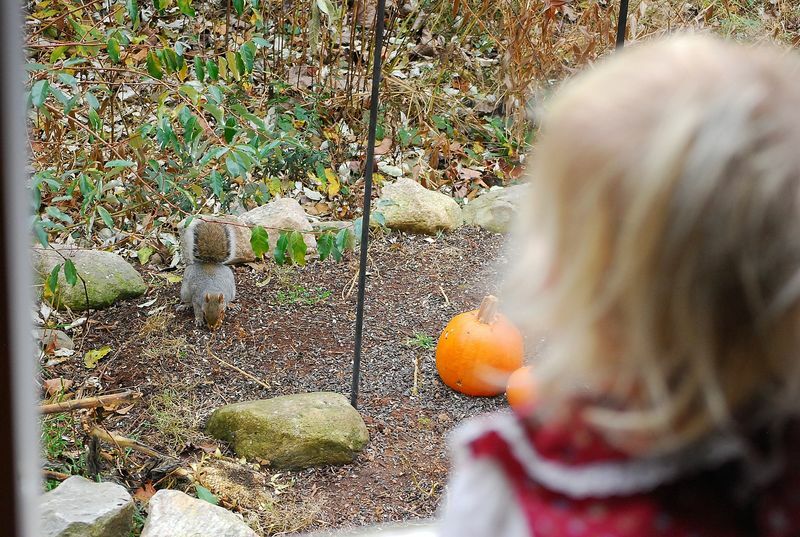 To our knowledge, this is the first squirrel to ever visit. 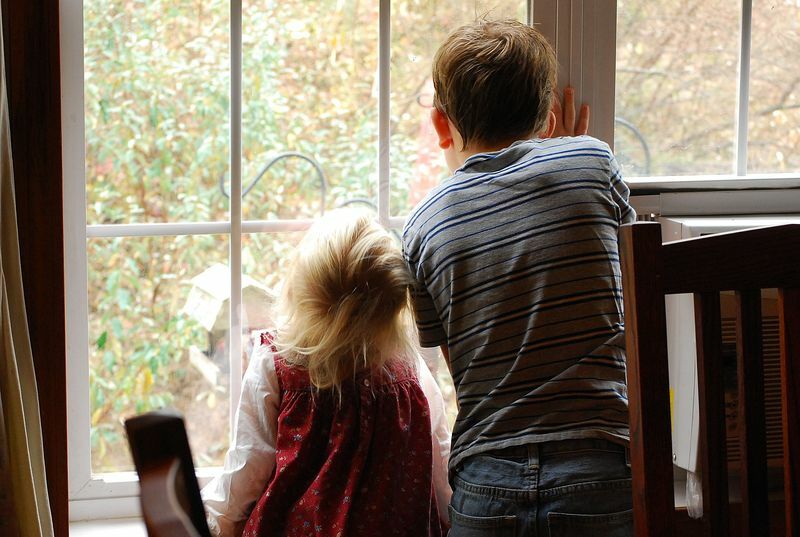 In fact, “we have no squirrels” is one of the children’s favorite nature laments. So, this was a big treat for us. We watched it eat seed from it’s handy, small paws and admired it’s luxurious tail. This entry was posted in Uncategorized and tagged nature by Shanda. Bookmark the permalink. Funny, I too recently made a post about an interesting bird we saw. Not the same kind as yours though. So many pretty birds! I don’t know if your children will appreciate this or not, but we’ve been watching a chipmunk sneak onto our deck and devour our pumpkins! He actually climbs into the jack o lantern, fills his cheeks to overflowing, then scampers out through the mouth, off the table, off the deck, to wherever his hidey-hole is.My children, btw, do NOT appreciate this. lol. I love that story!!! So sweet, it could be a children’s book. Beautiful birds! We’ve got plenty of squirrels round here. ;)Stay safe! It looks like the birds are preparing for the storm! I’m so glad Rich is home with you — stay safe for the next few days! Nice bird pictures! 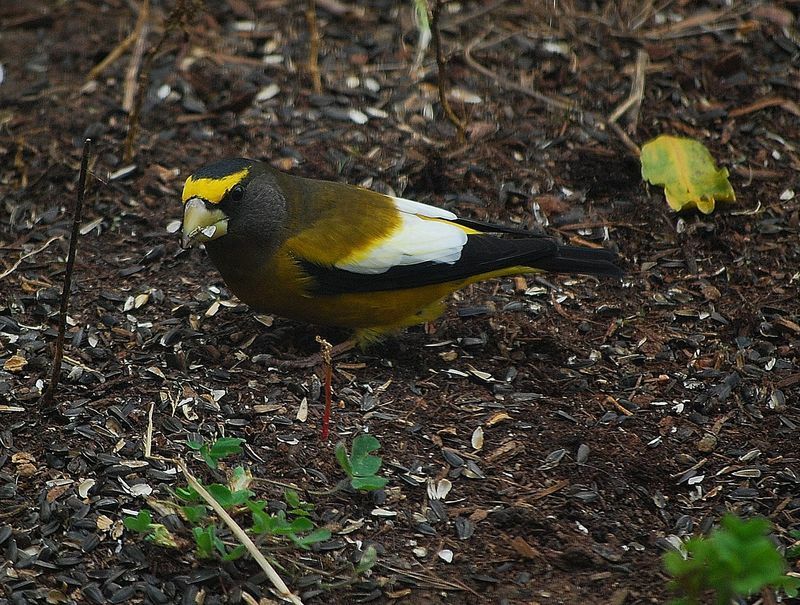 We haven’t had Evening Grosbeaks around here in quite some time. My husband’s kind of glad as they can empty bird feeders real fast!! We’re just beginning to see some rain and wind here — stay safe!! 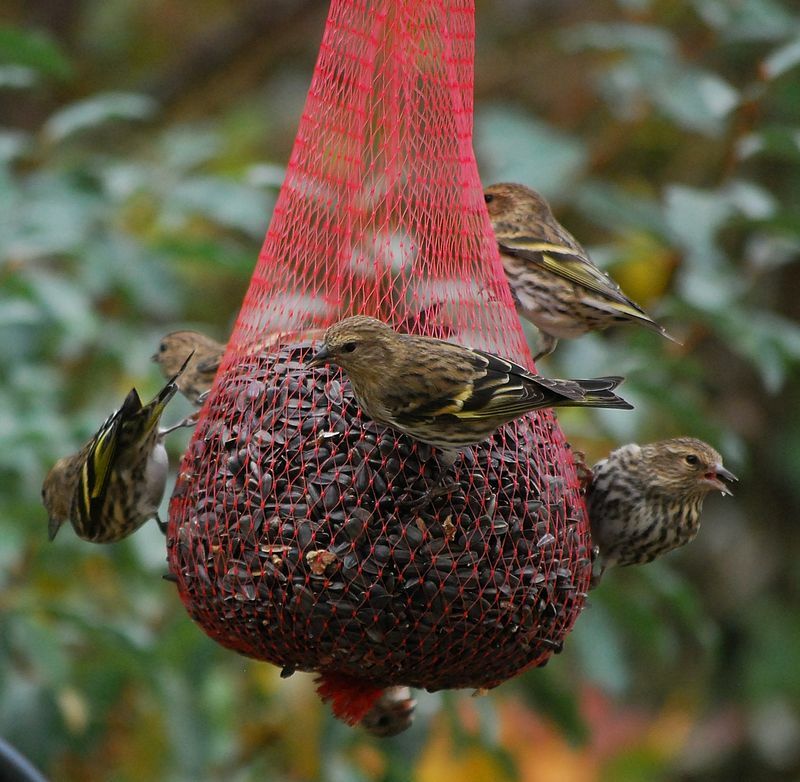 My girls and I enjoyed all of your bird pictures.We especially liked the flock of Pine Siskins. You guys stay safe! Hope all is okay during and after the storm. love how each bird is so different! 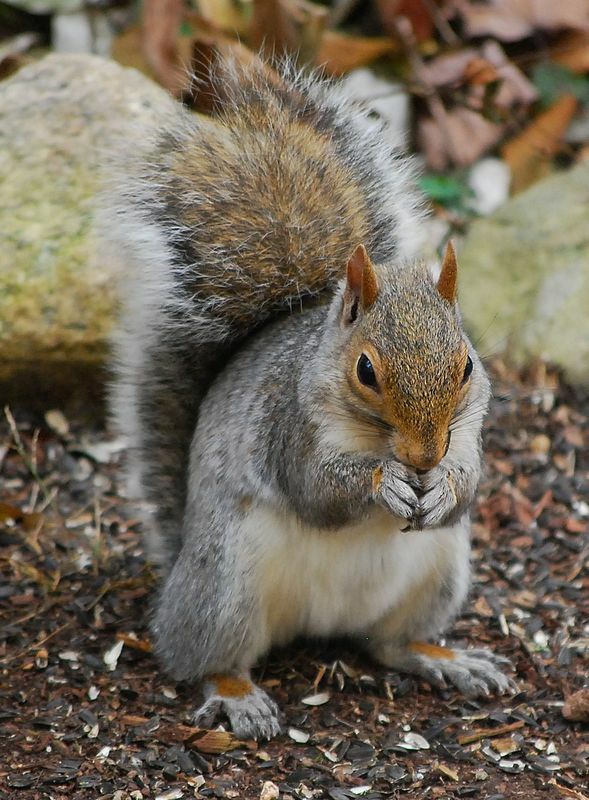 and that squirrel.. he’s a cutie!hope you guys stay warm and cozy until the storm passing. been thinking of all my east coast friends..even we’re having effects from it all up here! Your pictures are beautiful; I love the close-up detail! The little red Pine Siskins are my favorites. 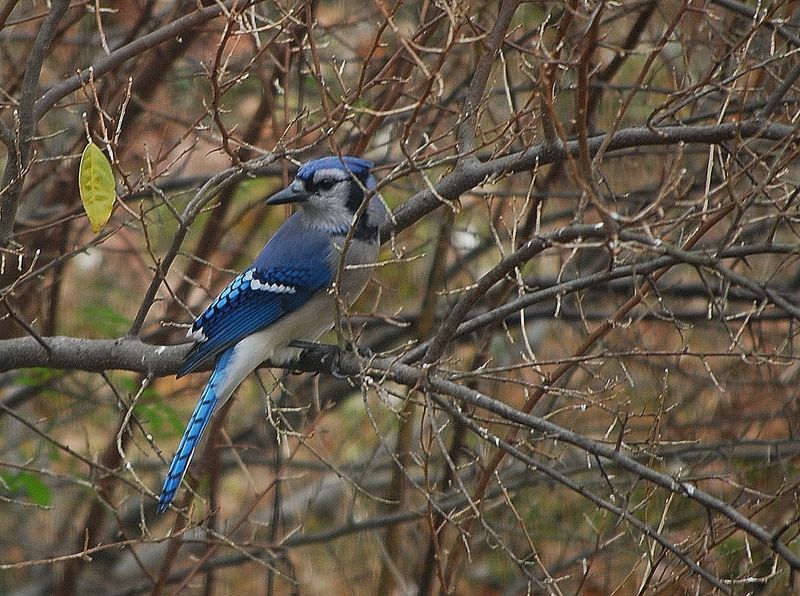 Your bluejay is prettier than our Western Bluejays but yes, they are glutenous! And loud! Usually when a storm is coming our way, more birds than ever come and get their fill. I just need to set up my camera on the tripod so that I can capture them! (I can’t shoot free-hand with a heavier lens). I’ve been thinking of you all and praying you’ll be safe through whatever “Sandy” dumps out! So good to read an update and hear how you all are doing. I am happy to hear all your “duckies” are staying at home, including your hubby. I hope and pray all goes well and you just have a couple days of cozy hunkering down. The birds must know what is up and are stocking up too! What a great bunch of birds you have had. They are lovely! Praying you and your family are safe and sound. Please give us an update when you can. Awesome pictures of your birds! You have such a variety there…such pretty birds. Surely they enjoyed your Fall Decor! I know I did, even if they didn’t! So beautiful ! The children here made two bird feeders ( pine ones smothered in peanut butter then rolled in seeds) but there is not a dry day to hang them outside!! It’s been raining every day.